The Mongolic languages are a group of languages spoken in East-Central Asia, mostly in Mongolia and surrounding areas plus in Kalmykia and Buryatia. The best-known member of this language family, Mongolian, is the primary language of most of the residents of Mongolia and the Mongolian residents of Inner Mongolia, with an estimated 5.7+ million speakers. The closest relatives of the Mongolic languages appear to be the extinct Khitan and Tuyuhun languages. Some linguists have grouped Mongolic with Turkic, Tungusic, and possibly Koreanic and Japonic as part of the controversial Altaic family. Contemporary Mongolic languages are classified as follows. Alexander Vovin (2007) identifies the extinct Tabγač or Tuoba language as a Mongolic language. However, Chen (2005) argues that Tuoba (Tabγač) was a Turkic language. The classification and numbers of speakers above follow Janhunen (2006) except for Southern Mongolic, which follows Nugteren (2011). In another classificational approach, there is a tendency to call Central Mongolian a language consisting of Mongolian proper, Oirat and Buryat, while Ordos (and implicitly also Khamnigan) is seen as a variety of Mongolian proper. Within Mongolian proper, they then draw a distinction between Khalkha on the one hand and Southern Mongolian (containing everything else) on the other hand. A less common subdivision of Central Mongolic is to divide it into a Central dialect (Khalkha, Chakhar, Ordos), an Eastern dialect (Kharchin, Khorchin), a Western dialect (Oirat, Kalmyk), and a Northern dialect (consisting of two Buryat varieties). The broader delimitation of Mongolian may be based on mutual intelligibility, but an analysis based on a tree diagram such as the one above faces other problems because of the close contacts between, for example, Buryat and Khalkha Mongols during history, thus creating or preserving a dialect continuum. Another problem lies in the sheer comparability of terminology, as Western linguists use language and dialect, while Mongolian linguists use the Grimmian trichotomy language (kele), dialect (nutuγ-un ayalγu) and Mundart (aman ayalγu). Rybatzki (2003: 388-389) recognizes the following 6 areal subgroups of Mongolic. The following are mixed Sinitic–Mongolic languages. Pre-Proto-Mongolic is the name for the stage of Mongolic that precedes Proto-Mongolic. Proto-Mongolic can be clearly identified chronologically with the language spoken by the Mongols during Genghis Khan's early expansion in the 1200-1210s. Pre-Proto-Mongolic, by contrast, is a continuum that stretches back indefinitely in time. It is divided into Early Pre-Proto-Mongolic and Late Pre-Proto-Mongolic. Late Pre-Proto-Mongolic refers to the Mongolic spoken a few centuries before Proto-Mongolic by the Mongols and neighboring tribes like the Merkits and Keraits. Certain archaic words and features in Written Mongol go back past Proto-Mongolic to Late Pre-Proto-Mongolic (Janhunen 2006). Pre-Proto-Mongolic has borrowed various words from Turkic languages. The above words are thought to have been borrowed from Oghur Turkic during the time of the Xiongnu. Later Turkic peoples in Mongolia all spoke forms of Common Turkic (z-Turkic) as opposed to Oghur (Bulgharic) Turkic, which withdrew to the west in the 4th century. The Chuvash language, spoken by 1 million people in European Russia, is the only living representative of Oghur Turkic which split from Common Turkic around the 1st century CE. Words in Mongolic like dayir (brown, Common Turkic yagiz) and nidurga (fist, Common Turkic yudruk) with initial *d and *n versus Common Turkic *y are sufficiently archaic to indicate loans from an earlier stage of Oghur (Pre-Proto-Bulgaric). This is because Chuvash and Common Turkic do not differ in these features despite differing fundamentally in rhotacism-lambdacism (Janhunen 2006). Oghur tribes lived in the Mongolian borderlands before the 5th century, and provided Oghur loanwords to Early Pre-Proto-Mongolic before Common Turkic loanwords. Proto-Mongolic, the ancestor language of the modern Mongolic languages, is very close to Middle Mongol, the language spoken at the time of Genghis Khan and the Mongol Empire. Most features of modern Mongolic languages can thus be reconstructed from Middle Mongol. An exception would be the voice suffix like -caga- 'do together', which can be reconstructed from the modern languages but is not attested in Middle Mongol. The languages of the historical Donghu, Wuhuan, and Xianbei peoples might have been related to Proto-Mongolic. For Tabghach, the language of the founders of the Northern Wei dynasty for which the surviving evidence is very sparse, and Khitan, for which evidence exists that is written in the two Khitan scripts which have as yet not been fully deciphered, a direct affiliation to Mongolic can now be taken to be most likely or even demonstrated. Juha Janhunen (2006) classified the Khitan language into the "Para-Mongolic" family, meaning that it is related to the Mongolic languages as a sister group, rather than as a direct descendant of Proto-Mongolic. Alexander Vovin (2017) has also identified several possible loanwords from Koreanic languages into the Khitan language. Vovin (2015) identified the extinct Tuyuhun language as yet another Para-Mongolic language. ^ a b c Juha Janhunen (2006). The Mongolic Languages. Routledge. p. 393. ISBN 978-1-135-79690-7. ^ Hammarström, Harald; Forkel, Robert; Haspelmath, Martin, eds. (2017). "Mongolic". Glottolog 3.0. Jena, Germany: Max Planck Institute for the Science of Human History. ^ Vovin, Alexander. 2007. ‘Once again on the Tabγač language.’ Mongolian Studies XXIX: 191-206. ^ Chen, Sanping 2005. Turkic or Proto-Mongolian? A Note on the Tuoba Language. Central Asiatic Journal 49.2: 161-73. ^ Rybatzki, Volker. 2003. "Intra-Mongolic taxonomy." In Janhunen, Juha (ed). The Mongolic Languages, 364-390. Routledge Language Family Series 5. London: Routledge. ^ Golden 2011, p. 31. ^ Andrews (1999:72), "[...] believed that at least some of their constituent tribes spoke a Mongolian language, though there is still some argument that a particular variety of Turkic may have been spoken among them." ^ Vovin, Alexander. (2017). Koreanic loanwords in Khitan and their importance in the decipherment of the latter. Acta Orientalia Academiae Scientiarum Hungaricae, 70(2), 207-215. ^ Vovin, Alexander. 2015. Some notes on the Tuyuhun (吐谷渾) language: in the footsteps of Paul Pelliot. In Journal of Sino-Western Communications, Volume 7, Issue 2 (December 2015). Andrews, Peter A. (1999). Felt tents and pavilions: the nomadic tradition and its interaction with princely tentage, Volume 1. Melisende. ISBN 978-1-901764-03-1. Janhunen, Juha, ed. (2003). The Mongolic languages. Routledge Language Family Series. London: Routledge. ISBN 978-0-7007-1133-8. Janhunen, Juha. 2012. Khitan – Understanding the language behind the scripts. SCRIPTA, Vol. 4: 107–132. Janhunen, Juha (2006). "Mongolic languages". In Brown, K. (ed.). The encyclopedia of language & linguistics. Amsterdam: Elsevier. pp. 231–234. Luvsanvandan, Š. (1959). "Mongol hel ajalguuny učir". Mongolyn Sudlal. 1. Nugteren, Hans (2011). Mongolic Phonology and the Qinghai-Gansu Languages (Ph.D.). Netherlands Graduate School of Linguistics / Landelijke – LOT. Poppe, Nicholas (1964) . Grammar of Written Mongolian. Wiesbaden: Harrassowitz. Sechenbaatar, Borjigin (2003). The Chakhar dialect of Mongol – A morphological description. Helsinki: Finno-Ugrian society. [Sechenbaatar] Sečenbaγatur, Qasgerel, Tuyaγ-a, B. ǰirannige, U Ying ǰe. (2005). Mongγul kelen-ü nutuγ-un ayalγun-u sinǰilel-ün uduridqal. Kökeqota: ÖMAKQ. Starostin, Sergei A.; Dybo, Anna V.; Mudrak, Oleg A. (2003). Etymological Dictionary of the Altaic Languages. Leiden: Brill. Svantesson, Jan-Olof; Tsendina, Anna; Karlsson, Anastasia; Franzén, Vivan (2005). The Phonology of Mongolian. New York: Oxford University Press. Vovin, Alexander (2005). "The end of the Altaic controversy (review of Starostin et al. 2003)". Central Asiatic Journal. 49 (1): 71–132. Vovin, Alexander. 2007. Once again on the Tabgač language. Mongolian Studies XXIX: 191–206. Baarin (Mongolian ᠪᠠᠭᠠᠷᠢᠨ Baγarin, Chinese 巴林 Bālín) is a dialect of Mongolian spoken mainly in Inner Mongolia. The Bonan language (pronounced [p⁼aoˈnaŋ], Baonang) (Chinese 保安语 Bǎo'ān yǔ, Amdo Tibetan Dorké) is the Mongolic language of the Bonan people of China. As of 1985, it was spoken by about 8,000 people, including about 75% of the total Bonan ethnic population and many ethnic Monguor, in Gansu and Qinghai Provinces and the Ningxia Hui Autonomous Prefecture. There are several dialects, which are influenced to varying degrees — but always heavily — by Tibetan and Chinese, while bilingualism in Wutun is less common. The most commonly studied is the Tongren dialect. There is no writing system in use. The language is also referred to as "Manegacha", natively. Buryat or Buriat (; Buryat Cyrillic: буряад хэлэн, buryaad xelen) is a variety of the Mongolic languages spoken by the Buryats that is classified either as a language or major dialect group of Mongolian. Classical Mongolian is an extinct Mongolic language formerly used in Mongolia, China, and Russia. It is a standardized written language used in the 18th century and 20th centuries. Notable texts include the translation of the Kanjur and Tanjur and several chronicles roughly between 1700 and 1900.Classical Mongolian sometimes refers to any language documents in Mongolian script that are neither Pre-classical (i.e. Middle Mongol in Mongolian script) nor modern Mongolian. The Dagur or Daghur language is a Mongolic language primarily spoken by members of the Dagur ethnic group. 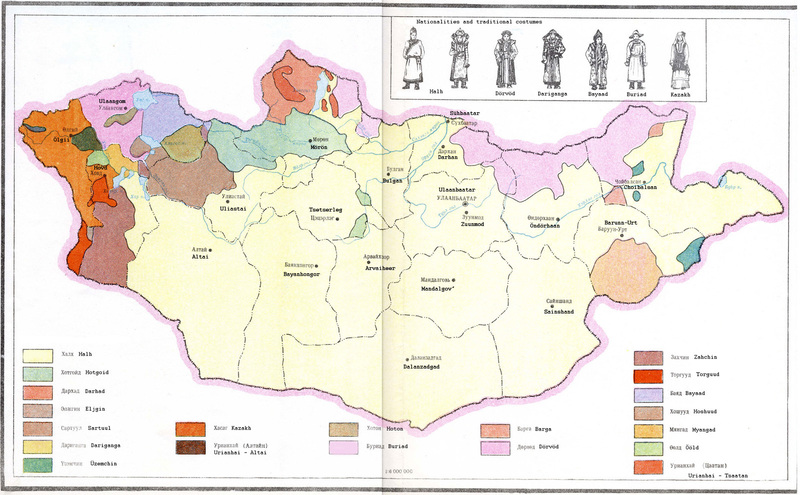 Eastern Yugur is the Mongolic language spoken within the Yugur nationality. The other language spoken within the same community is Western Yughur, which is a Turkic language. The terms may also indicate the speakers of these languages. Traditionally, both languages are indicated by the term Yellow Uygur, from the autonym of the Yugur. Eastern Yugur speakers are said to have passive bilingualism with Southern Mongolian, the standard spoken in China.Grigory Potanin recorded a glossary of Salar language, Western Yugur language, and Eastern Yugur language in his 1893 Russian language book The Tangut-Tibetan Borderlands of China and Central Mongolia. The Kangjia language (in Chinese, 康家语 Kāngjiā Yǔ) is a recently discovered Mongolic language spoken by a Muslim population of around 300 people in Jainca (Jianzha) County, Huangnan Tibetan Autonomous Prefecture in Qinghai province of China. As to its taxonomic affiliation, Kangjia seems to be an intermediate between Bonan language and Dongxiang language (Santa). Khamnigan is a Mongolic language spoken east of Lake Baikal. The Khamnigan people, called the Horse Tungus or Steppe Tungus, are natively bilingual, speaking both a Mongolic and a Tungusic language, which are inherited from their mixed ancestry. This bilingualism appears to be several centuries old. Their Tungusic language is Evenki (Khamnigan is the Mongol name for the Evenki), while Khamnigan Mongol is a distinct Mongolic language, not a dialect of Mongol or Buryat as traditionally classified in Mongolia or Russia. Mongol is the dominant language; the two dialects of Evenki are only used by part of the population, and then at home. The language has declined in Russia, with few speakers left, but both Khamnigan Mongol and Evenki bilingualism remain vigorous in China. Khamnigan Evenki, though not a distinct language from other Evenki, is heavily influenced by Mongol, especially in vocabulary. Khamnigan Mongol, on the other hand, is the most conservative Mongolic language, little different from Middle Mongolian, though the system of vowel harmony has been disrupted. There is little influence from Evenki: although Khamnigan Evenki has a grammatical plural, for example, Khamnigan Mongol does not.Khamnigan in Mongolia has strongly assimilated to Khalkha Mongolian, and even though some Buryat-like and idiosynchratic features are to be found (e.g. the very particular mood system lacking in Khamnigan in China), it overall resembles a dialect of Khalkha, and it has lost its particular Tungusic lexicon. Khitan or Kitan ( in large script or in small, Khitai; Chinese: t 契丹語, Qìdānyǔ), also known as Liao, is a now-extinct language once spoken by the Khitan people (4th to 13th century). It was the official language of the Liao Empire (907–1125) and the Qara Khitai (1124–1218). The Mongolic languages are a language family that is spoken in East-Central Asia, mostly in Mongolia, Inner Mongolia, an autonomous region of China, Xinjiang, another autonomous region of China, the region of Qinghai, and also in Kalmykia, a republic of Southern European Russia. Mongolic is a small, relatively homogenous and recent language family whose common ancestor, Proto-Mongolian, was spoken at the beginning of the second millennium AD.However, Proto-Mongolian seems to descend from a common ancestor to languages like Khitan, which are sister languages of Mongolian languages (they do not descend from Proto-Mongolian but are sister languages from an even older language from the first millennium AD, i.e. Para-Mongolian).The Mongolic language family has about 6 million speakers. The best-known member of this language family, Mongolian, is the primary language of most of the residents of Mongolia and the Mongolian residents of Inner Mongolia, with an estimated 5.2 million speakers.. The Monguor language (Chinese: 土族语; pinyin: Tǔzúyǔ; also written Mongour and Mongor) is a Mongolic language of its Shirongolic branch and is part of the Gansu–Qinghai sprachbund (also called the Amdo sprachbund). There are several dialects, mostly spoken by the Monguor people. A written script was devised for Huzhu Monguor (Mongghul) in the late 20th century, but has been little used. A division into two languages, namely Mongghul in Huzhu Tu Autonomous County and Mangghuer in Minhe Hui and Tu Autonomous County, is considered necessary by some linguists. While Mongghul was under strong influence from Tibetan, the same holds for Mangghuer and Chinese, and local dialects of Chinese such as Gangou were in turn influenced by Monguor. Khoton in Tarialan, Uvs.There are some varieties that are difficult to classify. The Alasha dialect in Alxa League in Inner Mongolia originally belonged to Oirat and has been classified as such by some because of its phonology. But it has been classified by others as Mongolian proper because of its morphology. The Darkhad dialect in Mongolia's Khövsgöl Province has variously been classified as Oirat, Mongolian proper, or (less often) Buryat.Oirat is endangered in all areas where it is spoken. In Russia, the killing of a large fraction of the Kalmyk population and the destruction of their society as consequences of the Kalmyk deportations of 1943, along with the subsequent imposition among them of Russian as the sole official language have rendered the language obsolescent: it is almost exclusively the elderly who have a fluent command of Kalmyk. In China, while Oirat is still quite widely used in its traditional ranges and there are many monolingual speakers, a combination of government policies and social realities has created an environment deleterious to the use of this language: the Chinese authorities' adoption of Southern Mongolian as the normative Mongolian language, new educational policies which have led to the virtual elimination of Mongolian schools in Xinjiang (there were just two left as of 2009), policies aiming to curtail nomadism, and the limited occupational prospects in Chinese society for graduates of Mongolian schools. As for Mongolia, the predominance of Khalkha Mongolian is bringing about the Khalkhaization of all other varieties of Mongolian. Ordos Mongolian (also Urdus; Mongolian ᠣᠷᠳᠣᠰ; Chinese 鄂尔多斯 È'ěrduōsī) is a variety of Central Mongolic spoken in the Ordos City region in Inner Mongolia and historically by Ordos Mongols. It is alternatively classified as a language within the Mongolic language family or as a dialect of the Central Mongolian Mongolian standard language. Due to the research of Antoine Mostaert, the development of this dialect can be traced back 100 years. The Ordos vowel-phoneme system in word-initial syllables is similar to that of Chakhar Mongolian, the most notable difference being that it has [e] and [e:] instead of [ə] and [ə:]. In southern varieties, *ɔ merged into /ʊ/, e.g. while you still say ɔrtɔs in Ejin Horo Banner, it has become ʊrtʊs in Uxin or the Otog Front Banner. In contrast to the other dialects of Mongolian proper, it retains this distinction in all following syllables including in open word-final syllables, thus resembling the syllable and phoneme structure of Middle Mongolian more than any other Mongolian variety. E.g. MM /ɑmɑ/ Ordos /ɑmɑ/ Khalkha /ɑm/ 'mouth', Ordos /ɑxʊr/ Khalkha /ɑxr/ ([ɑxɑ̯r]) 'short; short sheep's wool'. Accordingly, it could never acquire palatalized consonant phonemes. Due to their persistent existence as short non-initial phonemes, /u/ and /ʊ/ have regressively assimilated *ø and *o, e.g. *otu > /ʊtʊ/ 'star', *ɡomutal > /ɡʊmʊdal/ 'offence', *tʰøry > /tʰuru/ 'power'. An analogous change took place for some sequences of *a and *u, e.g. *arasu > /arʊsʊ/.Ordos retains a variant of the old comitative case and shares the innovated directive case. The verb system is not well researched, but employs a notable innovated suffix, ⟨guːn⟩, that does not seem to adhere to the common division into three Mongolic verb suffix classes.The lexicon of Ordos is that of a normal Mongolian dialect, with some Tibetan and Chinese loanwords. Proto-Mongolic is the hypothetical ancestor language of the modern Mongolic languages. It is very close to the Middle Mongol language, the language spoken at the time of Genghis Khan and the Mongol Empire. Most features of modern Mongolic languages can thus be shown to descend from Middle Mongol. An exception would be the Common Mongolic pluritative voice suffix -cAgA- 'do together', which can be reconstructed from the modern languages but is not attested in Middle Mongol. The languages of the Donghu and Wuhuan might be related to Proto-Mongolic, as well as that of the Xianbei and the Tuoba clan/subgroup (the language of the founders of the Northern Wei) and Khitan. Because the surviving evidence for Xianbei/Tuoba is very sparse, one can hypothesize, but not definitively state, that a genetic relationship could be possible. In the case of Khitan, there is rich evidence, but most of it is written in the two Khitan scripts that have as yet not been fully deciphered. However, from the available evidence it has to be concluded that a genetic relationship to Mongolic is likely. The Santa language, also known as Dongxiang (Chinese: 东乡语; pinyin: Dōngxiāng yǔ), is a Mongolic language spoken by the Dongxiang people in northwest China. Torgut (also known as Torghut or Torghud) is a dialect of the Oirat language spoken in Xinjiang, in western Mongolia and in eastern Kalmykia (where it was the basis for Kalmyk, the literary standard language of that region). Thus, it has more speakers than any other variety of Oirat. It is better researched than any other Oirat variety spoken in China. Tuoba (Tabγač or Tabghach; Chinese: 拓跋) is an extinct Mongolic or Turkic language spoken by the Tuoba people in northern China around the 5th century AD during the Northern Wei dynasty. Tuyuhun (Chinese: 吐谷渾) is an extinct language once spoken by the Tuyuhun of northern China about 500 AD. Alexander Vovin (2015) identifies the extinct Tuyuhun language as a Para-Mongolic language, meaning that Tuyuhun is related to the Mongolic languages as a sister clade but is not directly descended from the Proto-Mongolic language. The Khitan language is also a Para-Mongolic language. Tuyuhun had previously been identified by Paul Pelliot (1921) as a Mongolic language. The Wutun language (Chinese: 五屯话; pinyin: Wǔtún huà) is a Chinese–Tibetan–Mongolian creolized language. It is spoken by about 2,000 people, most of whom are classified as Monguor (Tu) by the Chinese government. Wutun speakers reside in two villages (Upper Wutun 上五屯 and Lower Wutun 下五屯) of Tongren County, eastern Qinghai province, China. It is also known as the Ngandehua language.The two Wutun villages, as well as other villages in the area, were under the control of a Mongol banner for several centuries, and have long been regarded by governments as members of a Mongol ethnic group. However, they self-identify as Tibetans.